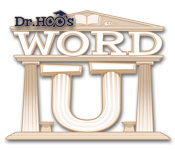 Word U is rated 3.5 out of 5 by 22. Rated 5 out of 5 by malbla from Great Spelling Game Love the game. However it needs more levels. There is only 25 levels. I have played it 3 times from beginning to end in the last week. It is a brain teaser. With the age of auto correct many people can't spell. This game will help you learn to spell. Rated 5 out of 5 by AdrianaIP from Great brain exercise and build up your vocabulary This is another winner for this developer. You have to switch tiles to create words. If you are good at SCRABBLE, you will love it. It gets harder and harder, with tiles that cannot be moved, and with less swaps allowed (you can get more as your points build up). You can while hours happily at this. There is no timer, unless you use the challenge mode. When it is over, you want more. Fortunately you can replay it, and since the set ups are never the same, you can replay and replay and replay. This one is a keeper. Rated 5 out of 5 by MyChicken from Love this game Some reviewers have said that they didn't like this game because of a lack of a submit button. I think this makes the game more challenging. To make the bonus word you have to think ahead and make sure the letters you trying to use don't make another word. I don't mind the fact that I don't recognise some of the more obscure words. I try to remember them so I can look this up later and expand my vocabulary. Rated 5 out of 5 by saratt from Fun and Challenging This is a great word game if you like just making words from a board of letters. The challenge is that you have to make a set number of words with only a set number of swaps (swapping letters to make words) per round. As the rounds go the number of words increase and the number of swaps decrease so you really have to be imaginative in creating words. As you score points you get more swaps so it is possible to go pretty far. Definitely try the demo, I almost didn't because of the poor reviews but I ended up loving it and buying it. Rated 5 out of 5 by ecblisa from Definitely not for kids -- just keep playing! I've played this game three times now, each time to an ignominious end at around level 23. (By that, I mean that I had moves left, but no place to make them.# The game is deceptively simple: Just make horizontal or vertical words by moving one letter one space #later you get power-ups that are devilishly difficult to use really well#. 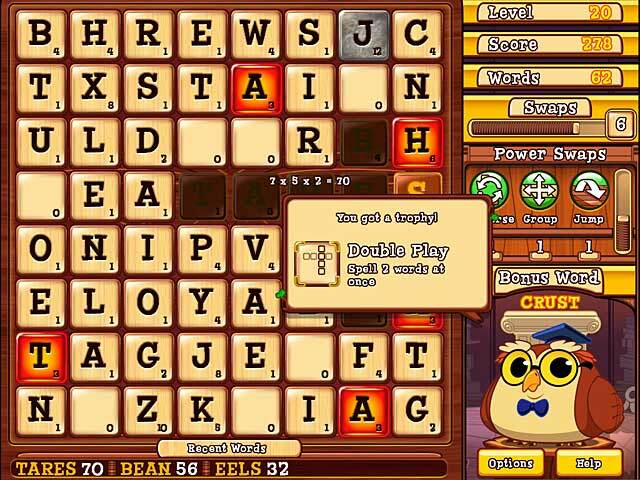 That simple start leads to a cross between word games and match-3 games, in that some of the letters turn into burning tiles #you cannot exchange them, but they do drop#, and then also stone tiles #you cannot exchange them, and they do NOT drop#. By the time you get to level 20 or so, the difficult tiles completely control your game, because you have to get rid of them, or you will be stuck. Once you've finished the game, you will realize that your entire strategy has to be not just to make words, but to make the best words and use the best strategy. I have gotten as far as I have only because I know many words kids don't know. #I think "stucco" is my highest scoring word so far, using two multiplier tiles.) So, if you like word games, ignore the "it's for kids" judgments of people who played only a few levels. This one is actually serious work. OK, not as creative as some word games, but tough enough for experts. Rated 5 out of 5 by vault07 from So refreshing to try something different! Relaxing. Soft music. A great game to unwind to. I like it. Rated 5 out of 5 by mspurple54 from Word U for U I thought the game is really fun and challenging. The reviews that was disappointed with the challenge element might not have played it long enough. The only thing I found a bit frustrating was when you make a long word, it finds the first word it recognizes. For example, I tried to make the word swimming and it took swim. However, I think that is part of the challenge because you can spell out part of the word like...swi and the ming and add in the other m for your last letter and you spell swimming. Try it, you might like it. Rated 5 out of 5 by wrennie from Great word game ! I really liked this one. 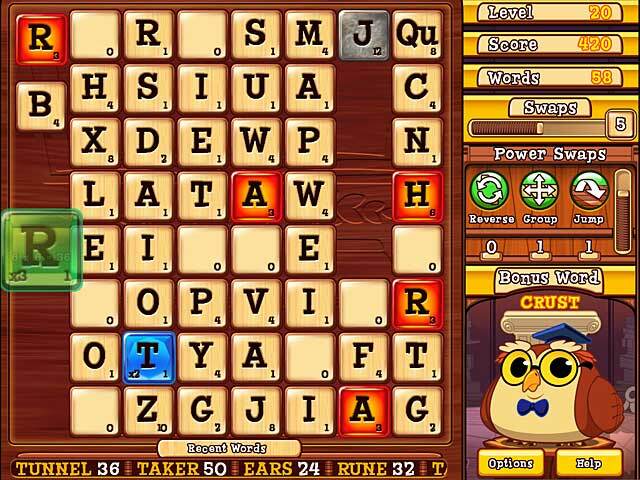 It recognizes a lot more words than the normal word games and for one who knows a lot of wordes, that's wonderful. The music isn't obnoxious, either. It's very unobtrusive. There are points for longer words and they begin with four letter words instead of the regular 3-letter. There's lots of blank letters (no points for these, or course); letters you can swap one for one or a group at a time; groups of letters you can move over; "on fire" letters that have to be played where they lie and bonus multipliers for lengthy words. I found this to be an adult-oriented game worthy of purchase. 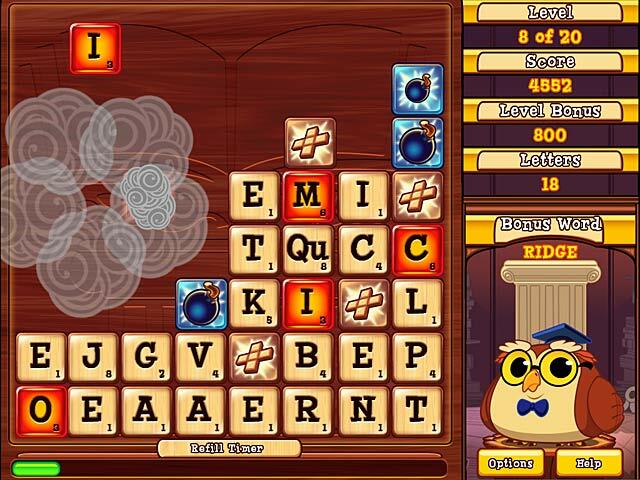 If you like word games, this is one of the best that's been offered in a long time.